Lawmakers and supporters applaud after Gov. 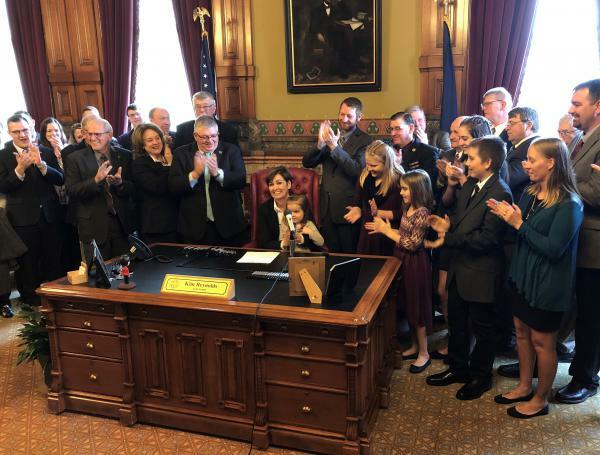 Kim Reynolds signs the Agricultural Production Facility Trespass bill into law Thursday, March 14, 2019. The 2012 law made it a crime for people to obtain access to an agricultural facility using false pretenses. The U.S. District Court for the Southern District of Iowa ruled the law is unconstitutional because it violates the First Amendment’s free speech protections. The state is appealing that ruling. Stringer said this tries to give special protection to the agriculture industry. “It would have a chilling effect on exposing problematic worker conditions, health and safety violations, and animal cruelty,” Stringer said. The House and Senate passed the new bill Tuesday, with some Democrats joining Republicans to vote in favor. House Speaker Linda Upmeyer, R-Clear Lake, said she is very concerned about biosecurity. Asked if the legal bills piling up from the first law and likely court challenge of the new law are worth it, she pointed to the losses Iowa suffered because of the 2015 bird flu outbreak. “Whether it’s intentional or unintentional, I think the security involved in these kinds of facilities is necessary,” Upmeyer said.